A cute little baby polar bear standing on its hind legs is about as tall as its mother but in a year's time, the size of this cub will change immensely. 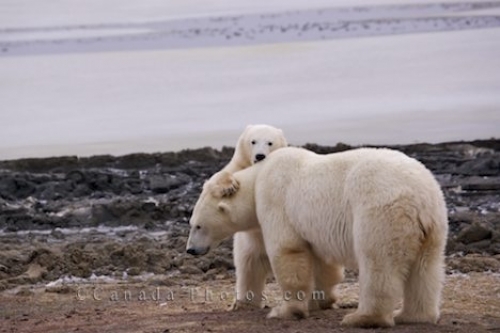 While the cub finds playing a highlight of its day, the mother Polar Bear stays alert of any danger that might lurk around the area of Churchill, Manitoba. Picture of a baby Polar Bear playing with its mother on the tundra of the Churchill Wildlife Management Area in Manitoba.